We didn’t know it when Audi introduced the 2019 A8 last summer, but it wasn’t just one of the most comfortable, luxurious, and high-tech cars Audi has ever made; it was a peek at Audi’s clever new approach to building a four-door sedan. Many of the same technology, luxury, and performance features the flagship inaugurated have trickled down to the latest A6, which made its debut a few months ago at the Geneva auto show. We traveled to Portugal for our first drive of the 2019 Audi A6 to get a feel for how the A8 influenced its smaller sibling, and whether Audi’s latest can ruffle the competition’s feathers. That last point is important because the competition is fiercer than it’s ever been. The A6 is part of a three-way, Gibson vs. Fender-style rivalry against the Mercedes-Benz E-Class and the BMW 5 Series. It’s the newest of the bunch, which gives it a sizable advantage right off the bat. Buyers not fond of Teutonic transportation can also look at the Cadillac CTS, the Volvo S90, the Lexus GS, the Jaguar XF, and the Infiniti Q70. At launch, every member of the A6 lineup will come with a V6 engine. An Audi spokesperson told Digital Trends a four-cylinder-powered model could arrive later in the production run, though the company hasn’t finalized those plans yet. And, because the A6 won’t go on sale in America until later this year, we don’t have concrete information about its trim levels, features, and pricing. We expect it won’t cost significantly more than the outgoing car, which starts at $56,500 with a V6. We’ve experienced Audi’s triple-screen technology in the A8 and, more recently, in the A7, and it continues to impress us. It gives the cabin a neat, uncluttered look with very few buttons. It starts with a 12.3-inch digital instrument cluster that replaces the analog gauges typically embedded behind the screen. It’s a driver-configurable unit that displays the map, connectivity options, or key information about the car and its surroundings. We like having the navigation shown in the instrument cluster because it’s better aligned with our line of sight than when it’s on the dashboard. The second, 10.1-inch screen is on the center stack. It’s framed by a black bezel, so it almost fades into the dashboard when it’s off. You can’t tell it’s there until it turns on, which is a neat party trick. It’s a high-resolution, touch-sensitive unit with haptic and acoustic feedback that’s smartphone-like in operation. It displays the internet-connected navigation, media options, and car settings, among other functions. The front passengers can drag and drop icons to re-arrange the home menu and even set easy-to-access favorites. The high level of functionality, attention to detail, and user-friendliness make it our favorite infotainment system in the A6’s segment. There’s almost no learning curve involved; if you can use a smartphone, you can navigate Audi’s software. It’s as simple as that. The third screen is directly below the one used for the infotainment. It’s a smaller, 8.6-inch unit mainly used to set the climate control. It replaces the half-dozen dials, sliders, and buttons normally found on the dashboard. Handwriting recognition technology also lets the front passengers use the bottom screen to write an address into the GPS. Narrow Road Assist technology automatically provides steering inputs to make sure you don’t end up pressed under a semi trailer like an overcooked chicken quesadilla. Offered at an extra cost, the adaptive cruise control system incorporates traffic sign recognition technology to accelerate or brake as needed. The system knows when the car is traveling through a construction zone with a lower speed limit, for example, and slows down to match it. Consider this a fair warning: you won’t be able to say “I didn’t see the sign” if you get caught speeding. “It’s right there on your dashboard,” you’ll hear as you get handed a ticket. And, while we’re talking about construction zones, think of the sinking feeling you get when the space between the orange cones on your left and the Freightliner carrying a Maersk container on your right is barely wider than your car. The A6’s available Narrow Road Assist technology automatically provides steering inputs to make sure you don’t embed a cone into the one of the four rings on the grille, or end up pressed under a semi trailer like an overcooked chicken quesadilla. Parking sensors are so 2005. Of course the A6 has them. It also has cameras that provide the driver with a 360-degree view of the car’s environment, which we used when driving through narrow cobblestone streets paved when Portugal still had colonies in Latin America. Finally, the system emits visual and audible warnings if it detects the driver is about to curb one of the alloy wheels. The ruthless rivalry between Mercedes-Benz, BMW, and Audi has forced all three companies to step up their game when it comes to interiors. Audi’s stands out with a sculpted design and quality materials like leather, wood, and soft-touch plastics. It’s not just tech that trickles down from the top; 10 years ago, getting a cabin like the A6’s required moving up into A8 territory. The natural materials add a touch of contrast to an otherwise tech-intensive interior. These two polar opposites come together to make the A6 a pleasant place to travel in. And, much like our earlier reference to the Gibson vs. Fender rivalry, it’s largely a matter of preference. We like the elegant, clutter-free design because it’s contemporary without going completely over-the-top; those who don’t will likely prefer the 5 Series, which offers a more old-school, sports sedan-like look. Audi managed to make the new-generation A6 a little bit more spacious inside than its predecessor without drastically increasing its already not-insignificant footprint. The front passengers travel on power-adjustable chairs that make it easy to find a comfortable position. From the driver’s seat, controls like the shift lever, the drive mode selector and, yes, even the volume knob (thank you, Audi, for not deleting it) are right where you expect to find them. It took no more than an afternoon’s worth of driving to get comfortable with the car’s interior layout. The rear bench offers space for three passengers, though they’ll rub shoulders if they’re full-grown adults. Stick to two occupants and they’ll enjoy plenty of space, even with six-footers up front, plus a fold-down central armrest and their own air vents. Trunk space checks in at 18.7 cubic feet, which is near – but not at – the top of the segment. In comparison, the 5 Series and the XF both offer 19 cubes while the E-Class settles for 13. Audi scattered several storage bins across the cabin, including a small one under the front armrest which incorporates a wireless phone charger and one deep enough to double as a Batcave on the left side of the dashboard. 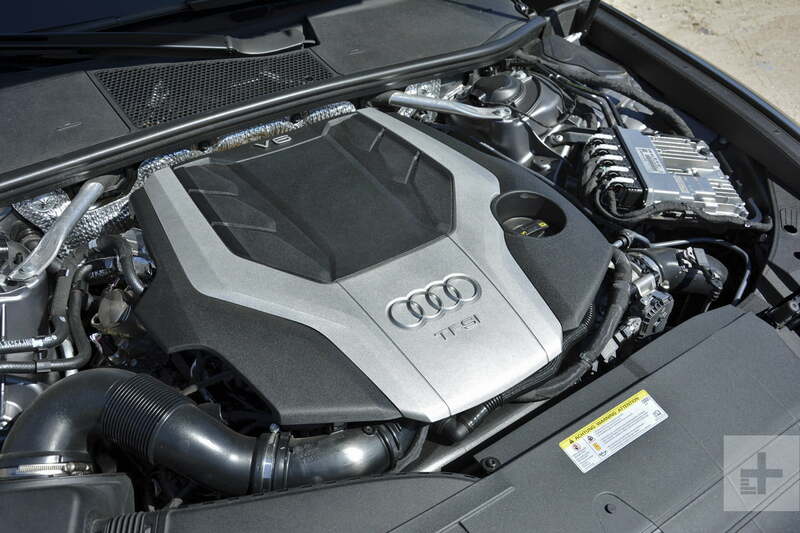 Popping the A6’s hood reveals a turbocharged, 3.0-liter V6 engine that makes 335 horsepower between 5,000 and 6,400 rpm and 368 pound-feet of torque over a broad range that stretches between 1,370 and 4,500 rpm. It shifts through a seven-speed dual-clutch automatic transmission with steering wheel-mounted paddles and Audi’s time-tested quattro all-wheel drive system. After just a few miles it becomes evident the A6 was born to cruise, cruise, and cruise some more. If you shop BMW, the A6’s closest rival is the 540i with a 335-horsepower straight-six. Over at Mercedes, the E400 comes with a twin-turbocharged V6 that makes 329 horses. They’re all in the same ballpark, though note BMW charges $2,300 extra for its xDrive all-wheel drive system. The E-Class, like the A6, comes with all-wheel drive when ordered with a six-cylinder engine. While the V6 drives the wheels, there’s another part of the powertrain discreetly working behind the scenes. The A6 is electrified, and right away we’ll answer the question that just popped into your mind: no, it’s not electric. You can’t drive it on electricity alone. In this case, electrification takes the form of a mild hybrid system consisting of a belt-alternator and a 48-volt electrical system fed by a lithium-ion battery hidden under the trunk floor. The technology boosts fuel economy while helping fire up the engine faster and more smoothly after the stop-start system turns it off. The hybrid system’s presence is virtually indiscernible in normal driving conditions. It interferes when needed without fundamentally changing how the A6 drives, which is precisely how Audi envisioned it. The V6 starts up with a muffled roar and settles into a smooth, almost melodic idle. It’s barely audible as it begins to spin faster and move the A6 forward. There are just enough decibels penetrating into the cabin to remind you of the 335 horses lurking under your right foot. It doesn’t get much louder at freeway speeds, either, and it’s appreciably quieter than the outgoing model. We used indoor voices to talk to our passengers, even at 80 mph. After just a few miles on the highway, it becomes evident the A6 was born to cruise, cruise, and cruise some more. It’s not just the quietness and the smooth power delivery that shows this side of the car; it’s also the comfort it delivers. The suspension feels firmer than the E-Class’ but not as buttoned-down as the 5 Series’ or the XF’s. It filters out all but the worst imperfections in the road before they enter the cabin, especially with the drive mode selector set to comfort. The A6 is quick off the line, and the quattro all-wheel drive system provides a surprising amount of grip in the corners. These drive modes aren’t gimmicks, bytheway; the spread between, say, comfort and dynamic is greater than ever before. Still, the A6 puts a stronger emphasis on comfort than on performance. The S6, which hasn’t been introduced yet, will adopt the opposite attitude. The upcoming RS 6 will go flat-out – if we’re lucky enough to get it. That’s not to say the A6 can’t play power chords and rock out when the occasion calls for it. It’s quick off the line, and the permanent quattro all-wheel drive system provides a surprising amount of grip in the corners. The V6 sings louder, almost egging you on, as you dig deeper into the throttle. This is the kind of sedan that inspires confidence with relatively neutral and predictable handling. It’s easy to place the front wheels where you want them and you know – rather than guess and hope – that the rear end will follow without getting distracted and try to break loose. Though communicative with good on-center feel, the steering is on the softer side of the scale, even with the drive mode selector set to dynamic. We understand it needs to be light for parking and in-town driving, but we wish the more aggressive mode added more weight to the system. Our time behind the wheel was too short to measure real-world fuel economy. Providing an accurate number requires several days – and several hundred miles – behind the wheel. The Environmental Protection Agency (EPA) hasn’t tested the A6 yet. The A6 offers dual front, side, and curtain airbags in addition to traction and stability control systems. It also comes with Audi’s collision avoidance technology, which automatically applies the brakes if it detects a collision with another object (e.g., a car or a pedestrian) is imminent and unavoidable. Every new Audi includes a warranty valid for four years or 50,000 miles, whichever comes first. Audi also offers a 12-year warranty against corrosion perforation and, for added peace of mind, four years of 24-hour roadside assistance. As mentioned earlier, Audi won’t publish the list of standard and optional features until closer to the A6’s on-sale date. A lot of the tech you just read about (including the three screens) comes standard. We’d add the optional Bang & Olufsen sound system for a stereo that sounds like a concert hall. Smart and sophisticated, the 2019 Audi A6 is one of the strongest contenders in its class. Its highlight is technology; in this respect, it took a significant leap forward and hopscotched over the competition from BMW and Mercedes-Benz. It also packs the right amount of comfort and luxury features without cutting back on performance, which has become a must-have in this segment of the market.